Cyprus applied to join the Euro zone in February 2007 - the Euro becoming the official currency on 1st January 2008. Some basic facts relating to Cyprus. Cyprus Euro Coins (or perhaps more correctly Cypriot Euro Coins) are unique in that they alone have the name of the country in two different languages on the coin. As with many other countries in the Euro zone, Cypriot Euro Coins have three motifs - one for the "copper coloured coins"(1 cent, 2 cent and 5 cent), one for the "gold coloured coins" (10 cent,20 cent and 50 cent) and finally one for the one Euro and two Euro coins. 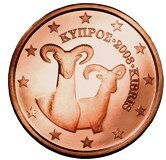 The first motif (1,2 and5 cent coins)is the Cyprus Mollon - a wild Cypriot Goat. 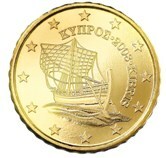 The second motif (10,20 and 50 cent coins) is the antique Ship of Kyrenia. 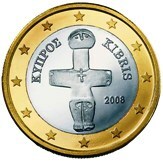 The third motif (1 and 2 Euro coins) is the idol of Pomos. The Cypriot coins are the only ones where the name of the country appears on the face of the coin in two different languages. They are Cypros (in the Greek alphabet) and Kibris which is the Turkish for Cyprus. 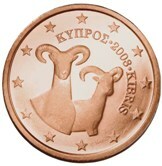 1 cent - The Cyprus Mollon - a wild Cypriot goat - representing nature. 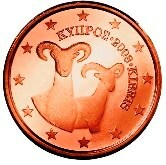 2 cent - The Cyprus Mollon - a wild Cypriot goat - representing nature. 5 cent - The Cyprus Mollon - a wild Cypriot goat - representing nature. 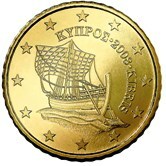 10 cent - The antique ship of Karenia - representing the sea. 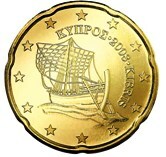 20 cent - The antique ship of Karenia - representing the sea. 50 cent - The antique ship of Karenia - representing the sea. 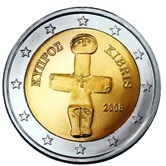 1 Euro - The Idol of Pomos- a 5000 year old figure - representing culture. 2 Euro - The Idol of Pomos- a 5000 year old figure - representing culture. Around the rim appears " 2 Euro", alternately in the Greek and the Latin alphabets. This appears twice. 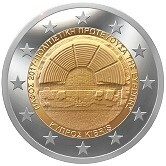 Cypriot Commemorative Two Euro Coins. 2017 - Paphos,European Capital of Cultire. Return from Cyprus Euro Coins to Links to Specific Countries. Return from Cyprus Euro Coins to euro coin collector.